When people think of unemployment, most of the time they imagine a situation where the economy slows down and businesses respond to the decrease in demand for their products by reducing production and laying off workers. Let’s explore this “cyclical” unemployment in more detail by considering the market for labor. Firms hire labor because they need workers to produce their products. Workers supply labor in order to earn income. Together, these represent the demand for and supply of labor, as we explained briefly earlier in the module on supply and demand. Equilibrium in the labor market occurs at the wage rate where the quantity of labor demanded equals the quantity of labor supplied. The equilibrium wage rate and employment level are shown in Figure 1. Figure 1. Equilibrium in the Labor Market. In a labor market with flexible wages, the equilibrium will occur at wage We and quantity Qe, where the number of people looking for jobs (shown by S) equals the number of jobs available (shown by D). Conversely, if firms perceive that the economy is slowing down or entering a recession, then they will wish to hire a lower quantity of labor at any given wage, and the labor demand curve will shift to the left. The variation in unemployment caused by the economy moving from expansion to recession or from recession to expansion (i.e. the business cycle) is known as cyclical unemployment. From the standpoint of the supply-and-demand model of competitive and flexible labor markets, unemployment represents something of a puzzle. 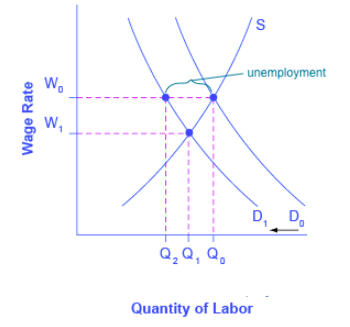 In a supply-and-demand model of a labor market, as illustrated in Figure 1, the labor market should move toward an equilibrium wage and quantity. 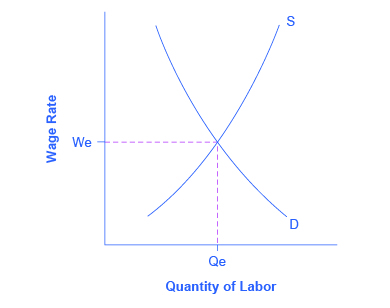 At the equilibrium wage (We), the equilibrium quantity (Qe) of labor supplied by workers should be equal to the quantity of labor demanded by employers. In other words, there should be no unemployment. One possibility for unemployment is that people who are unemployed are those who are not willing to work at the current equilibrium wage, say $10 an hour, but would be willing to work at a higher wage, like $20 per hour. The monthly Current Population Survey would count these people as unemployed, because they say they are ready and looking for work (at $20 per hour). But from an economist’s point of view, these people are choosing to be unemployed. Probably a few people are unemployed because of unrealistic expectations about wages, but they do not represent the majority of the unemployed. Instead, unemployed people often have friends or acquaintances of similar skill levels who are employed, and the unemployed would be willing to work at the jobs and wages similar to what is being received by those people. But the employers of their friends and acquaintances do not seem to be hiring. In other words, these people are involuntarily unemployed. What causes involuntary unemployment? Suppose that real world labor markets do not have perfectly flexible wages. In particular, even though wage increases may occur with relative ease, wage decreases are few and far between. One set of reasons why wages may be “sticky downward,” as economists put it, involves economic laws and institutions. For low-skilled workers being paid the minimum wage, it is illegal to reduce their wages. For union workers operating under a multiyear contract with a company, wage cuts might violate the contract and create a labor dispute or a strike. However, minimum wages and union contracts are not a sufficient reason why wages would be sticky downward for the U.S. economy as a whole. After all, out of the 150 million or so workers in the U.S. economy, only about 1.4 million—less than 2% of the total—are paid the minimum wage. Similarly, only 10.7% of American wage and salary workers were represented by a labor union in 2016. In other high-income countries, more workers may have their wages determined by unions or the minimum wage may be set at a level that applies to a larger share of workers. But for the United States, these two factors combined affect only about one-fifth or less of the labor force. Economists looking for reasons why wages might be sticky downwards have focused on factors that may characterize most labor relationships in the economy, not just a few. A number of different theories have been proposed, but they share a common tone. One argument is that even employees who are not union members often work under an implicit contract, which is that the employer will try to keep wages from falling when the economy is weak or the business is having trouble, and the employee will not expect huge salary increases when the economy or the business is strong. This wage-setting behavior acts like a form of insurance: the employee has some protection against wage declines in bad times, but pays for that protection with lower wages in good times. Clearly, this sort of implicit contract means that firms will be hesitant to cut wages, lest workers feel betrayed and work less hard or even leave the firm. Efficiency wage theory argues that the productivity of workers depends on their pay, and so employers will often find it worthwhile to pay their employees somewhat more than market conditions might dictate. One reason is that employees who are paid better than others will be more productive because they recognize that if they were to lose their current jobs, they would suffer a decline in salary. As a result, they are motivated to work harder and to stay with the current employer. In addition, employers know that it is costly and time-consuming to hire and train new employees, so they would prefer to pay workers a little extra now rather than to lose them and have to hire and train new workers. Thus, by avoiding wage cuts, the employer minimizes costs of training and hiring new workers, and reaps the benefits of well-motivated employees. The adverse selection of wage cuts argument points out that if an employer reacts to poor business conditions by reducing wages for all workers, then the best workers, those with the best employment alternatives at other firms, are the most likely to leave. The least attractive workers, with fewer employment alternatives, are more likely to stay. Consequently, firms are more likely to choose which workers should depart, through layoffs and firings, rather than trimming wages across the board. Sometimes companies that are going through tough times can persuade workers to take a pay cut for the short term, and still retain most of the firm’s workers. But these stories are notable because they are so uncommon. It is far more typical for companies to lay off some workers, rather than to cut wages for everyone. The insider-outsider model of the labor force, in simple terms, argues that those already working for firms are “insiders,” while new employees, at least for a time, are “outsiders.” A firm depends on its insiders to grease the wheels of the organization, to be familiar with routine procedures, to train new employees, and so on. However, cutting wages will alienate the insiders and damage the firm’s productivity and prospects. Finally, the relative wage coordination argument points out that even if most workers were hypothetically willing to see a decline in their own wages in bad economic times as long as everyone else also experiences such a decline, there is no obvious way for a decentralized economy to implement such a plan. Instead, workers confronted with the possibility of a wage cut will worry that other workers will not have such a wage cut, and so a wage cut means being worse off both in absolute terms and relative to others. As a result, workers fight hard against wage cuts. These theories of why wages tend not to move downward differ in their logic and their implications, and figuring out the strengths and weaknesses of each theory is an ongoing subject of research and controversy among economists. All tend to imply that wages will decline only very slowly, if at all, even when the economy or a business is having tough times. When wages are inflexible and unlikely to fall, then either short-run or long-run unemployment can result. This can be seen in Figure 2. Figure 2. Falling Demand for Labor. In a labor market where wages do not decline, a fall in the demand for labor from D0 to D1 leads to a decline in the quantity of labor demanded at the original wage (W0) from Q0 to Q2. These workers will want to work at the prevailing wage (W0), but will not be able to find jobs. From an initial equilibrium at W0 and Q0, suppose the demand for labor shifts to the left, from D0 to D1, as it would tend to do in a recession. Because wages are sticky downward, they do not adjust toward what would have been the new equilibrium wage (W1), at least not in the short run. 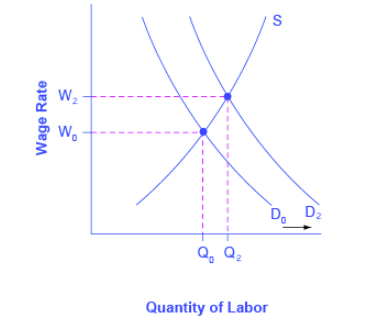 Instead, after the shift in the labor demand curve, the same quantity of workers is willing to work at that wage as before; however, the quantity of workers demanded at that wage has declined from the original equilibrium (Q0) to Q2. The gap between the original equilibrium quantity (Q0) and the new quantity demanded of labor (Q2) represents workers who would be willing to work at the going wage but cannot find jobs. In other words, the gap represents unemployment. Contrast the previous situation with the opposite scenario where demand for labor increases as the economy expands. If the expansion follows a recession, then the demand for labor shifts from D1 to D0 in Figure 2, reducing the unemployment and returning the labor market to equilibrium at W0 and Q0. This analysis helps to explain the connection noted earlier: that cyclical unemployment tends to rise in recessions and to decline during expansions. Figure 3 shows what happens if the economy continues to expand. The demand for labor shifts further right from D0 to D2, and the equilibrium quantity of labor hired increases from Q0 to Q2. Since wages are only sticky downward, the equilibrium wage rises from W0 to W2. It does not hurt employee morale at all for wages to rise. Figure 3. Rising Wage and Employment. In a labor market where wages are able to rise, an increase in the demand for labor from D0 to D2 leads to an increase in equilibrium quantity of labor hired from Q0 to Q2 and a rise in the equilibrium wage from W0 to W2. Watch this video for an explanation of cyclical unemployment and to learn more about why wages are sticky.